How to generate free leads for your network marketing business and get paid even when people do not join your team. 97% of the people who join a network marketing business never make a profit. 97% of the people never made more money than it costs them to stay active in the business. They never make enough money to cover their monthly autoship. Why is that? Have you ever thought about that question? Why do MOST people fail at network marketing? You will find yourself literally doing the same things that is causing the majority to fail… or… you'll find yourself NOT DOING what is necessary to ensure your success. Either way, you lose. Let's talk about the 7 most common reasons why most honest, hardworking, sincere people never make any money in network marketing and what you need to do about that to put the odds of success in your favor. Plus, when you know the reasons WHY most people will continue to struggle in this business, then you can easily brand yourself as the leader people are looking for because you can now show them exactly how and why they are having challenges. Make sense? Okay. #1 – Starting a business for emotional reasons. Another emotional reason might be because the company is endorsed by a well-known actor, doctor, or business leader. But the bottom line is “who cares” – just because Donald Trump or Winnie the Pooh endorse the company, products and comp plan doesn't mean it will be easier to build a business than it would be without them. Are THEY going to market your business for you? Of course not! Another emotional bait piece that is used quite often is the low cost of joining. It's only $29.95 to join and $10 per month to stay active and this means not only does everyone need to be IN… everyone can afford to be in. You'll get rich overnight. Can you see it? Oh my gosh… you better sign up right now! Or perhaps the most dangerous of all, you sign up under in your warm market (a family member, friend or co-worker) as a favor… or out of guilt… or because of the emotional need to reciprocate somehow. So instead of taking a good, hard, honest look at the business from the standpoint of building a profitable business – signing up for emotional reasons, regardless of the reason, is one of the biggest reasons the MAJORITY of people will never make a dime through MLM. The second reason is because the compensation plan has no room for a marketing budget – meaning the company does not pay enough upfront commissions to make advertising and marketing your business a viable solution – so you are literally FORCED to use nothing but free marketing and advertising methods which, more often than not, either don't work or don't work well enough or fast enough to launch your business into momentum. For example, did you know the average cost of getting a business opportunity lead by any number of direct marketing methods is between 4 and 12 dollars per lead? So let's crunch the numbers. Let's say the business you are involved with costs only $149 to join and it pays a nice $50 sign up bonus when you personally sponsor a new person. Which seems reasonable so you decide to run a card-deck advertising campaign which costs about $1,200 to reach 25,000 people. Now the average card-deck response is about 1% but let's TRIPLE that that just for fun – so you can expect 750 to respond to your ad for a cost of about $1.60 per lead which is really, really inexpensive. Now the average lead-to-sale conversion rate is about 1.5% – on the high side – but let's triple that again just for fun. So you are looking at potentially sponsoring 22 people. 22 x $50 = $1100 in sign up bonuses – which is pretty good actually because you are only upside down and out-of-pocket a $100. You spend $1200 to earn $1100 – BUT if any actually duplicates on your team you'll be smelling sweet. But let's keep it real here and realize we TOTALLY FUDGED the numbers. We were playing with a lead cost of only $1.60 per lead and, in the real world, you will be lucky to produce a good lead for under $4 – and… at $4 a lead… the entire house of cards comes tumbling down. So take a close hard look at your compensation plan. Is there room for a marketing budget in the real world? If not, then you might be advised to find another business if you really want to make any real money. Tragic, but true. The third reason most people will never make money in network marketing is that they lack marketing skills. In fact, the problem with network marketing, in general, is when you set out to sign up new people – you are asking these new people join a business that REQUIRES sales and marketing skills to make money (because nothing sells, no one make money!) – and the majority of these people have ZERO marketing experience. ZERO… and then we wonder why our business isn't growing. Think about it. You decide to approach your neighbor Jim about your opportunity because he seems like a sharp, capable, success-oriented guy. Now Jim's been working for the phone company for the past 30 years but you he just might be interested so you hit him up. And sure enough – he joins! and immediately asks you what he is supposed to do. So what do you say? You parrot back exactly what you have taught – make a list Jim of everyone you know… family, friends, and co-workers. Old teaches and kids from your childhood. Everyone. Call 'em up and sign em up. So Jim does that (probably not, but let's pretend) – so Jim calls everyone he knows and signs up his buddy Fred. So tomorrow Jim comes knocking on your door. Okay, I did that. I contacted everyone I know and signed up Fred. NOW, WHAT DO I DO? Now, what do I do to take my business to the next level? And you are going to tell him what? What would be your answer to the “now what” question? And because MOST people have no clue – which is all about sales and marketing – that's it. Their network marketing career stalls out. So if YOU are really serious about taking your business to the next level – to make a profit and live a lifestyle most people only dream about – understand that you MUST MASTER the art and science of sales and marketing. Plain and simple. Another big reason why most people will not ever build a profitable network marketing business is that they have no cash flow. Meaning you don't have a steady stream of income coming in to cover your expenses and to FUND your marketing efforts. Because the reality is, unless you get very lucky early on in your career and sponsor a heavy hitter, it will take a good 3-5 years or longer to build a nice executive residual income. 3-5 years… and without cash flow to cover the cost of doing business, most people don't have the extra resources to cover them for the long run. So the KEY is to create and market using FUNDED PROPOSALS so you can get paid even when people do not join your team. And we'll be talking a lot more about this in the modules ahead and, as you'll discover, there really is a way to create multiple streams of income NOW – so you can stay in the game long enough to create a quiet fortune. The cause of attrition is usually having a product or service you have to buy on autoship to stay active – that most people would not buy – at that price and from that company – if they were not getting paid to do so. Meaning, think of it this way. If it costs you $100 per month to stay active in your MLM and you get a 30 day supply of vitamins for that $100… ask yourself this question. If you did not have the promise of getting paid, would you spend $100 per month for vitamins from this company? 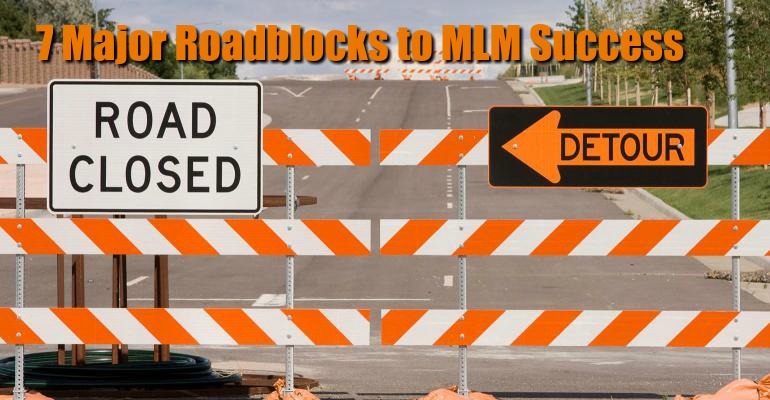 If not… your business will see a high attrition rate because, again, MOST… the MAJORITY of people will not ever make any money in network marketing because of all the reasons we discussed. And if they are not making any money – and they wouldn't pay for those products, at that price, from that company under normal circumstances – they will quit their autoship. 80-90% of the time. So if you are currently in a company where you would not buy that product, at that price in the normal market – again, you might want to serious reconsider trying to build a profitable business with that company, because you could be looking at a very steep uphill battle with the odds definitely stacked against you. Lack of leads is another big reason why most people do not enjoy success because when you really break it down to the money-making activities in network marketing – there are only three things you really need to do to make a fortune. You need to expose your products, service and business opportunity to new people on a regular basis, guide them into a simple presentation – follow up and enroll them. That's it. Simple as 1, 2, 3. Connect, direct and enroll. So the million dollar question is: where are you going to get your leads? How will you find new people to present your opportunity to on a consistent basis over an extended period of time? Lead prosperity LEADS to prosperity… but the opposite is also true. A lack of leads results in a lack of results. So the million dollar question is: where are you going to get your leads? How will you find new people to present your opportunity to on a consistent basis over an extended period of time? Lead prosperity LEADS to prosperity… but the opposite is also true. A lack of leads results in a lack of results. The final reason why most people will never make money in network marketing is they do not have an MLM marketing system in place. A tried and true, proven network marketing system that is designed to generate leads on a consistent basis… sift and sort through those leads by qualifying for interest, desire and financial ability… present, close and train. Because think about it – most of us already have full-time lives. We have a full-time job or career, full-time kids, full-time chores and full-time responsibilities. Yet we somehow need to create a full-time income working part-time in our spare-time. Which is literally IMPOSSIBLE unless you learn how to leverage your time and resources by utilizing a proven system. The 7 biggest reasons why most people fail to build a profitable network marketing home business. The good news is by simply learning what we have learned here today – you have now greatly increased your odds for success. Because if you find yourself in any of those critical categories… now you know what to do about it and why. And now that we know what NOT to do… it's time to find out what we should be doing. Because success leaves clues. Great big, giant footprints in the snow.